Side Impact Tested: Meets or exceeds all applicable federal safety standards and Evenflo�s side impact standards. Dimensions: 33.86 x 18.9 x 22.44 in. This stroller system is fantastic! Sleek, beautiful, small and lightweight! Excellent On The Go Stroller! I have had this stroller for a couple of months now and I am very pleased with it. It is lightweight and very easy to use. It was packaged very well and easy to put together. I love, love, love the fabric. It is such an awesome color and feels very nice too. The stroller and car seat are both very sturdy and safe. The stroller has a nice seat that lays back and you can also position the feet up as well so your child can lay flat when sleeping. It has a nice size basket on the bottom and it has an awesome removeable step that an older sibiling can stand on. It can be easily attached or taken off. The car seat attaches very easily and nicely in both the car seat base and stroller. 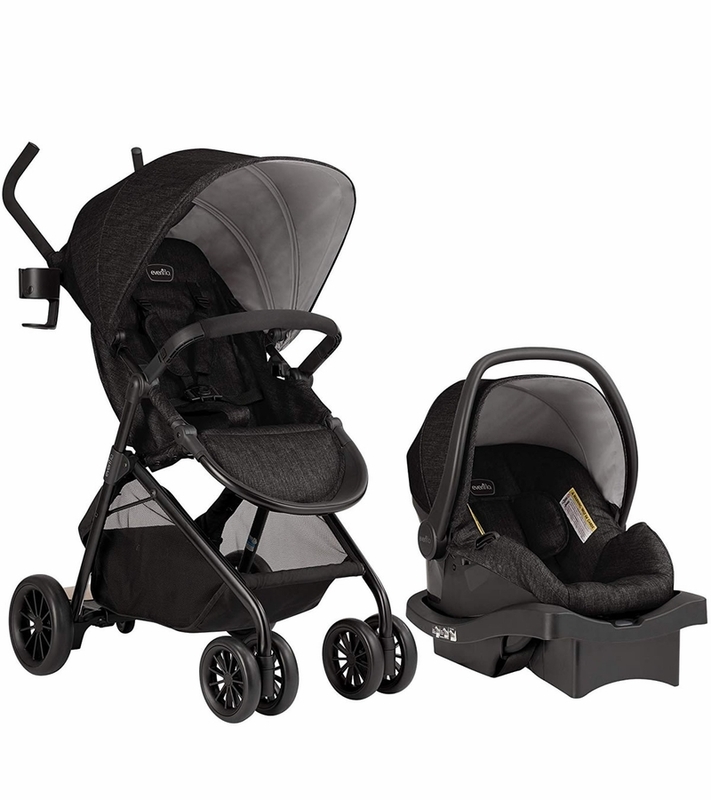 I am very happy with the Sibby Travel System and would recommend it to any mom. It's Great!! This stroller was easy to assemble. This also is a easy fold lightweight stroller. I will recommend this product to family and friends. Love the elegant look of this stroller and many of the features of both the stroller and the car seat. First off it took almost no time at all to put this together I would say maybe 15 minutes. It has a large canopy to cover baby and ample storage space in the basket underneath to hold all the stuff babies (and siblings and parents) require. It maneuvers very well and is super easy to fold and stowaway. The car seat is very light and easy to get baby in and out of. Baby seems very comfortable and well padded when in the seat. Oh and did I mention that the base is super easy to install into the car. On the flip side I wish there was a cupholder upfront for the child and also some place to put snacks. It could also use some additional console storage space for the parents like an additional cupholder. We have not used the skateboard feature yet but I think that will come in very handy when our older one doesn't want to walk. I am just concerned that it may get in the way when pushing the stroller. We have another Evenflo product and wish the handlebar could be adjusted to stand back a bit. Overall we are very happy with this product that we received. This is so easy to fold up and unfold. It's not bulky and heavy and my 3 year old loves the idea is using "the skateboard" so I am watch him and not have another stroller for him. My infant love the room this strollers gives her she doesn't feel confined in the stroller. I'd definitely recommend this car seat stroller to parents with more than 1 child. I love this stroller . the carseat snaps in so easy and it opens ans closes so easy and closes very small and stays locked. It also wheels very nice. I received this from Evenflo to try out and review. I would like to start out by saying how amazing the sun shades (canopy) is on the stroller and the seat. When they are used as a travel system together, the shades fit perfectly to block out sun or wind. 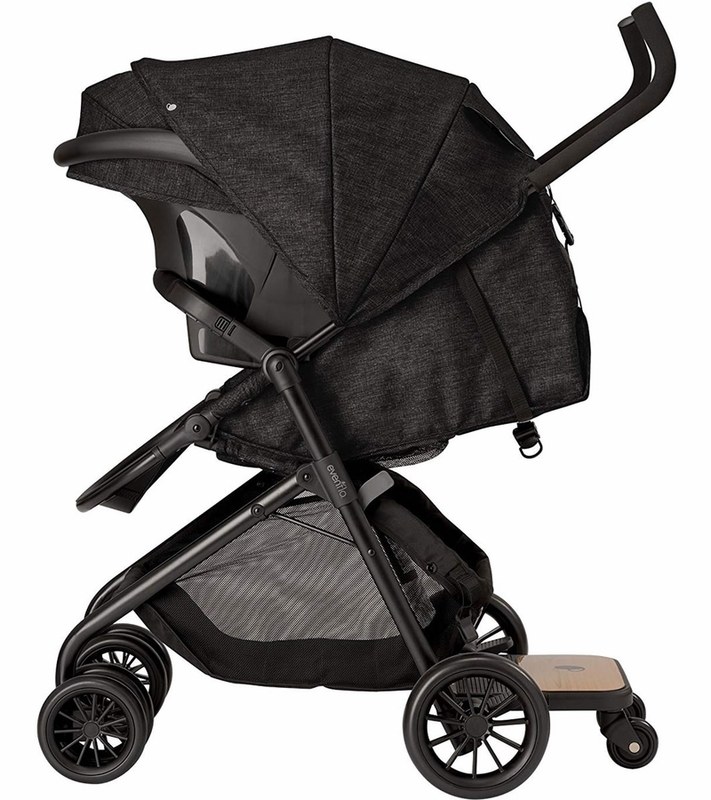 When used as a separate system the shades are still super convenient and cover the whole seat or most of the stroller.. protecting the child. The material doesn't seem like it would be very comfy just by looking at it, but it actually is. 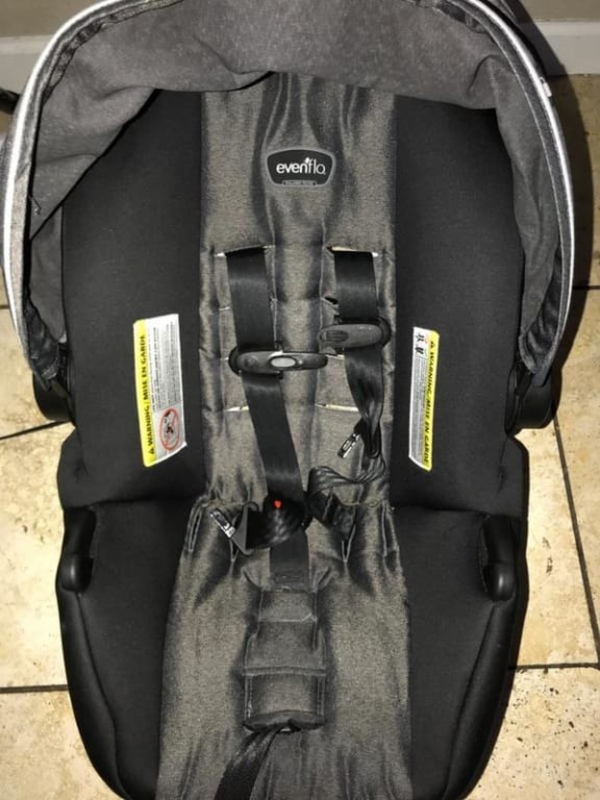 The seat itself is easy to install and the straps are comfortable along my child's shoulders. The best part about this is the "ride along" feature. I have a 5 year old son and he loves it!! It was great when we went shopping because he's not a shopper and tires out quickly, but too heavy to ride on the cart. We were grateful to have that feature so he could just get on as well! I did have a little trouble getting it folded down at first. I'm not sure if it's because it was new and not worn in yet, I'm hoping that will get easier. Overall this stroller travel system is a really great product and I would definitely recommend it! This is a nice beautiful travel system! It looks more expensive than it is. There are a lot of pros and a few cons. First of all it was easy to put together and didn't take very long. I love how big the storage basket is. You can fit a large diaper bag and your purse in there. There is a removable platform for an older sibling to ride on which is awesome! The foot rest moves and can be adjusted to accommodate the child. The stroller rides smooth and maneuvers easily. Also it is easy to fold when not in use. 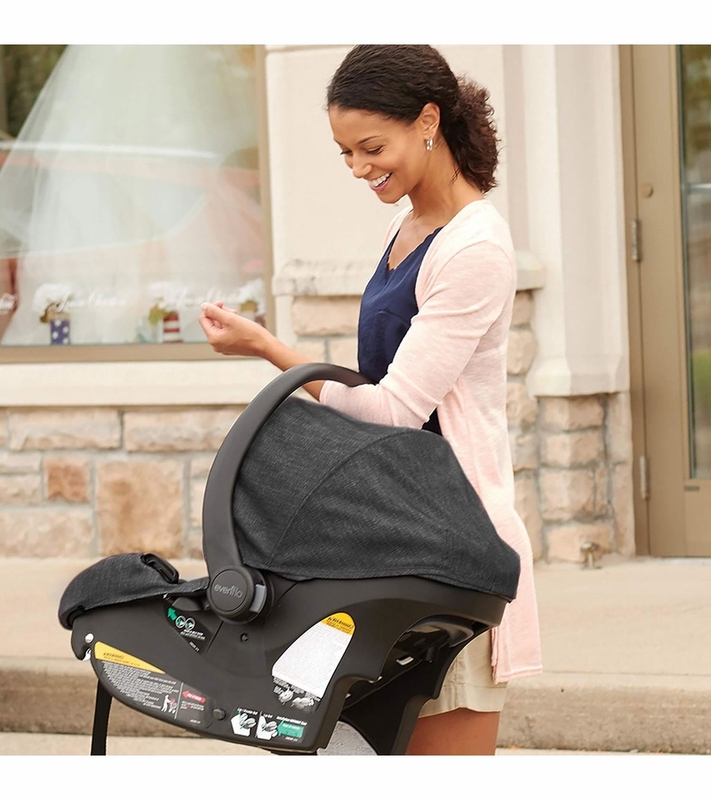 The car seat is very lightweight and it easily moves from the car to the stroller. Something that I did not like is that there is no tray for my keys or phone. There is also no snack tray for the child. The provided cup holder is removable but it doesn't seem too sturdy. There are no handles specifically for the older child riding on the platform. They just have to hold on to the handlebars. Overall I would recommend this travel system. 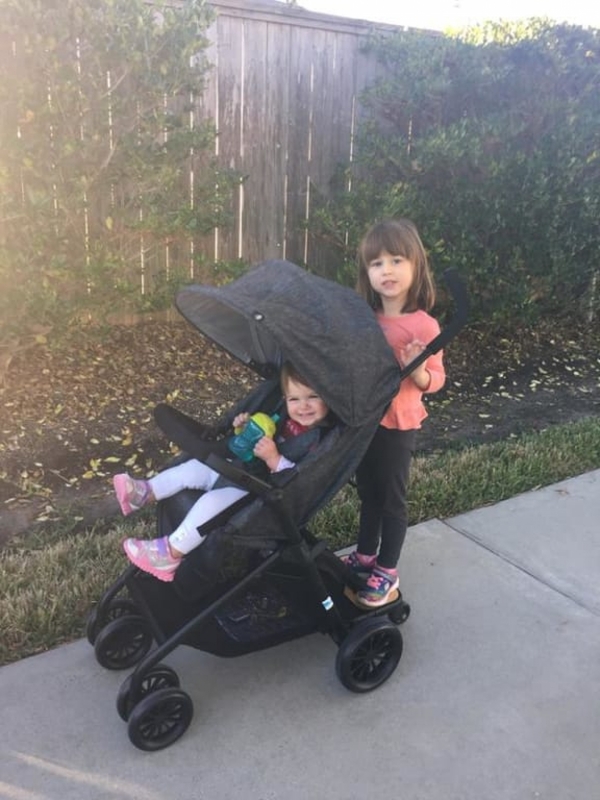 I got this stroller system because we do a lot of traveling and needed a stroller that was compact and easy to unfold but still could hold both our daughters. We were traveling this weekend and it worked perfectly! It folded up small enough that it was able to fit in the car and still have plenty of room for the luggage also. The best part is my 3 year old loves riding on the back! It's so much easier and less stressful to go through the airport when we don't have to be chasing her down yelling at her to hold our hands and not run away. It's so easy to fold and unfold that I can do it one handed while holding my daughter in my other arm. I keep it in the trunk of my car incase we need it while we're out. It's nice because the car seat it comes with snaps in. The car seat is nice because it is up to 35 pounds so my 16 month old is still small enough to fit in it. My 3 year old could even fit in it if we needed to! Also, it is so easy to assemble I was able to put it together in 10 minutes with the "help" of my 3 year old. The only regret I have about getting this stroller is I didn't get it when my baby was born! I love this system! The baby looks really comfortable and is safe in the car seat. The stroller is easy to use and fits great in the trunk of my car. I really love this leightweight stroller! The heathered grey makes it look trendy and more expensive then it really is. The basket underneath is a good size and the whole thing was a breeze to put together. I'm most excited about the toddler platform for when I need to use a single stroller for my baby but need to move quicker than my two year old wants to go (or to give him a rest if he's tired). The only downsides for this stroller is there there isn't a snack tray for the child or drink/phone/keys console for the parent (but I understand that would get in the way of the toddler riding the platform). The car seat appears to be good, but we haven't used it yet. Thoughtfully designed with fantastic perks! this stroller is SO much more than easy up & easy down. 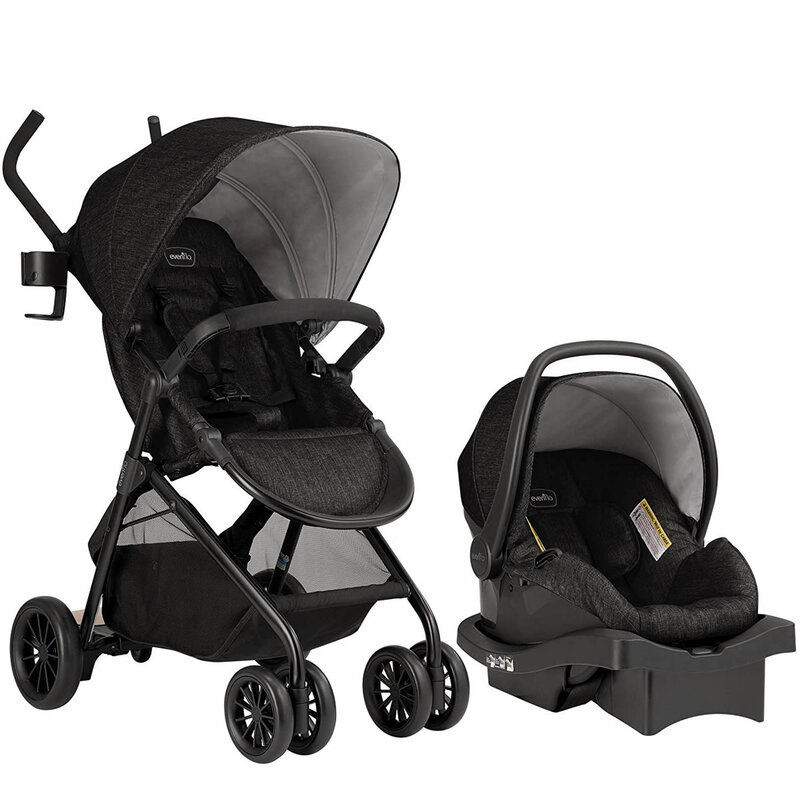 The denim like melange fabric give this budget friendly travel system a super high end look. I find the ease of building this stroller - a full size stroller, with the skateboard SO easy. Like really easy. once built, my toddler was immediately intrigued by it. she loved the board, they're a tad too short to hold the handles, though they squatted down & held onto the basket & all was well with their world. As for the seat, the belly bar is set far enough forward that my toddler can lean forward & hold on. Otherwise it's just there not impeding comfort or space. The parent handles are super comfortable. On our first walk, I must've been holding on for dear life, my triceps got quite the workout. I am thrilled with the size of the basket & the ease of access. Can we talk about when it's folded the handles don't touch the ground? and that it stands on it's own AND can roll (that means you don't lock the wheels-cue safety sue's eyeroll, hey, it works for us!) I'm loving the fact that this is a full size stroller that really is a perfect size for life. I not longer need any other stroller. Kind of amazing. The infant carrier. At first blush like any other seat. then I picked it up, UM hello it's like picking up a blanket compared to others on the market. There are nice safety bells & whistles. Easy to take on & off the base, a super ergonomic carry bar. The ONLY bad things I can think about is that I'm wondering about the rebound on such a light system AND the way you adjust the straps, a but cumbersome but otherwise, this travel system is a win for mom, dads, grandparents & the babes. I bought this a month ago and I am so happy I did. The instructions are easy to follow, and I had no problems assembling it. It glides with ease. If you have a toddler the sibling board is a must. My daughter loves riding on the sibling board and it has made it so much easier keeping her close. I had no problems moving through crowds with its sleeker design. And it's easy to fold and unfold. And the car seat is more secure then the last one I had. I would happily recommend it to anyone rather you travel a lot or not.. Great for all things from just a walk, to the store, to the zoo. I love how the 2 canopy covers work together to block out the bright sun and allows privacy. It's not something you can forget at home because it's attached to the stroller! You can adjust how open you want it for breathability. 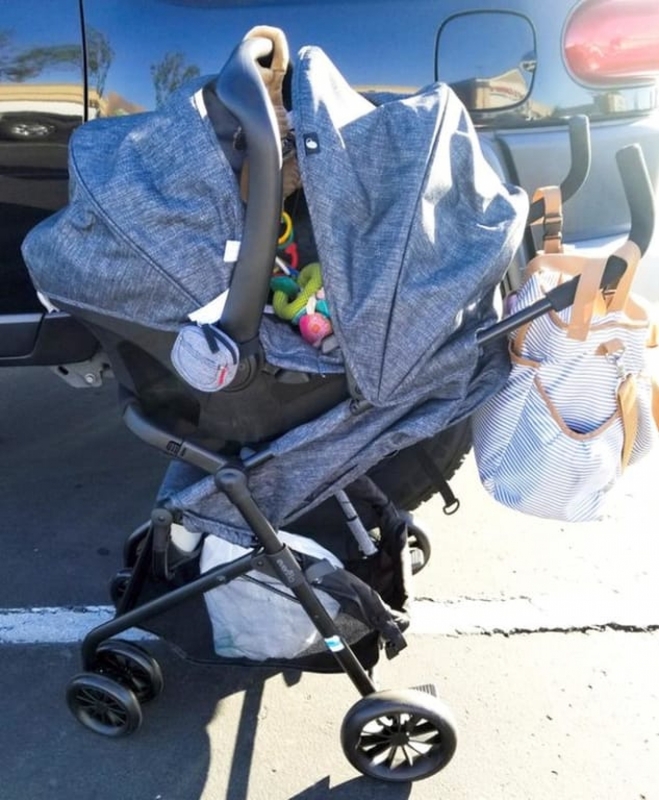 The only thing I'm not a big fan of is the fact that you must use the detachable stroller bar as it's what also helps to hold the car seat in place when attached to the stroller. Plus the bar doesn't have a snack tray, which would have been great. I do love that this car seat is interchangeable with the Safemax convenience base. It's also not too wide so I can fit through doorways easily, rides smoothly, and baby seems comfy in it! I received this item from company for review. I like how light the carseat and stroller are. I love that it's not as bulk as most travel systems are. The stroller is easy to steer, maneuver, and fold. The car seat is extra light not heavy weight like most. I thought I would love the stand for another child but I don't think its too practical. I wish there was a handle or something for them to hold on to but there isn't. Overall I'm happy with this travel system. This travel system is very simple to assemble out of the box! Basic, but has all the necessities. Classic gray color makes this a great neutral choice. Car seat comes with a base. It doesn't have shoulder strap pads, which could be a problem as the straps are close-set. It does, however, have two options for the straps at the hips, two options for the crotch buckle, and four options for shoulder height! Nicely padded, but the fabric is a little rough on both the car seat and the stroller. Stroller is easy to open, rolls nicely, and has a platform for an older sibling! I would recommend this travel system to my friends. Is the base and the board included? Does the car include the car seat and the base and the stroller adapters?